The goal of this portfolio is share accumulation, income, and income growth. The market value of the portfolio is of not much importance to me. In fact I prefer a crashing market during my accumulation phase so that each of my dollars can be used more effectively when buying shares. The S&P500 is nearly at an all time high. This news makes many people happy. Unfortunately, I am not in a terribly good mood since I cannot find quality companies for good value in this overheated market. I monitor my portfolio for dividend security and dividend increases. If a company appears to have financial trouble in maintaining their dividend, I will remove them from my portfolio. As of 4/2/2015 the Portfolio stands at $96,247. Inching ever closer to the $100k mark. I believe this month will be the special time when I am able to pass this mark for the first time. Yields are barely above 3.0%, ideally I want this number to be closer to 3.5% but it's just so hard to find higher yielding stocks in this bull market. My stock picking criteria is simple and follows many other DGI philosophies. The company must have an investment grade credit rating (BBB+ or higher). Must have a solid history of increasing dividends. The price is of fair value or undervalued. And solid earnings history. Brownie points are awarded to stocks that have low debt, yield that is 50% higher than the S&P500, and solid earnings even during recessions. Yield can be sacrificed if speculative growth stock positions are wanted. Cyclical stocks such as industrials will need to be below fair value for me to consider, since I want some safety margin when the market turns sour. My sector allocation is basically what I always wanted. The only problem is the lack of utilities. I do think a very good opportunity will arise when the Fed starts raising the interest rate. Utilities will surely fall. I think utilities are still overpriced. I believe in holding Staples. I like holding companies that will receive the people's dollar no matter what the economy is like. People always need to eat, drink, shower, brush their teeth, use toilet paper, etc. 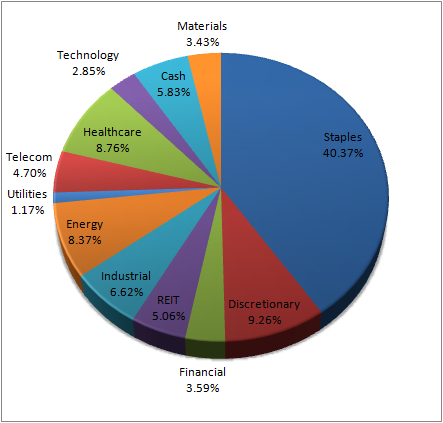 My other holdings are quite evenly distributed in the other sectors since I do believe that a portfolio should have different types of companies to tap into different opportunities. I hold no banks. My only financial stocks are TROW and V. My only tech stock is Apple and I hold it for purely speculative reasons. I am adverse tech and banks. I currently have 37 companies. 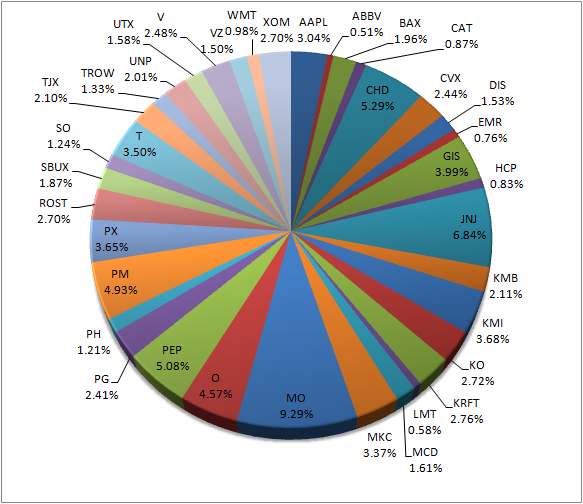 My top 5 holdings are MO, JNJ, CHD, PEP, and PM. These five together make up 30% of my portfolio. This is a bit heavy in my taste but my monthly contribution is high enough that this number will eventually drop. I am still in the accumulation phase and over allocations will eventually go away. MO and PM will be paying heavy dividends this month (April) so my large allocation will be appreciated. These two stocks (originally Altria) have in their history done very well in paying and increasing dividends.